BBC Radio 4’s long-running discussion programme The Moral Maze will pick up the coveted Trustees' Award at the 2017 Sandford St Martin Awards for religious broadcasting it was announced today. The BBC’s Director of Radio and Education, James Purnell, will present the award at the star-studded awards ceremony, held at Lambeth Palace on Wednesday 7 June. Announcing the recipient of the Trustees' Award Rt. Rev Nick Baines, Lord Bishop of Leeds, the Trust’s Chair says: "We live in a complex world, and this programme takes these complexities seriously. It also refuses to collude with the notion that all arguments must be reduced to the simplistic or the slogan. Sometimes annoying, usually riveting, always worth the listen." 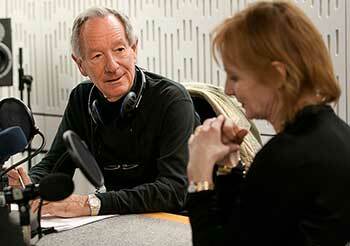 The Moral Maze host Michael Buerk says: "The Moral Maze is a very special part of the BBC. It's a highest common factor programme in an increasingly lowest common denominator world. It's a cockpit for live argument about the rights and the wrong of the burning issue of the week. There's nothing quite like it even on marvellous Radio 4. I'm very proud of it." Provocative and engaging, The Moral Maze has been examining the ethical issues behind the week’s news stories since 1990. Presented by respected journalist and broadcaster Michael Buerk since its inception, the series calls upon an eclectic panel of regular contributors drawn from the worlds of religion, politics and journalism including Claire Fox, Giles Fraser, Anne McElvoy, Michael Portillo, Melanie Phillips and Matthew Taylor. Previous panelists include Rabbi Hugo Gryn, Geoffrey Robertson, Michael Gove and David Starkey. One of the highlights of the Sandford St Martin awards ceremony, the prestigious Trustees' Award is presented to a recipient who has shown a long term or significant commitment to creating thought-provoking, distinctive programming that engages with religion of all faiths, ethics or morality. The Sandford St Martin Awards are designed to promote excellence in religious broadcasting, and to champion distinctive journalism and programming that intelligently interprets the world through a religious lens. The Trust encourages and advocates for religious literacy through public consultations, by producing events and providing training in partnership with other organisations throughout the year. There are six awards in total, including the Radio Times Readers' Award, voted for by its readers, and the coveted Trustees Award. High profile entries into this year’s awards include some the year's most talked about television including A World Without Down’s Syndrome (Dragonfly Film and Television) in which actress and writer Sally Phillips examines the implications for society of a new 99% accurate test for Down’s Syndrome, and Children on the Frontline: The Escape (ITN Productions for Channel 4), a powerful film about the Syrian civil war capturing the span of these tragic events. Voting for the Radio Times Readers' Award closes on 23 May 2017. To vote log on to radiotimes.com. PHOTOS: Top: Michael Buerk and Anne McElvoy, and above: the Moral Maze team. Photos copyright BBC.